After gaining a considerable share of the global tablet market, Amazon is preparing to introduce a smartphone of its own, according to a fresh report published in the Wall Street Journal (WSJ). Citing anonymous sources, the WSJ reported that Amazon recently demonstrated versions of its purported Kindle smartphone to developers in its hometown Seattle and San Francisco. The report added that the e-commerce giant has plans to introduce the smartphone by July and start shipping it by the end of September this year. The Kindle smartphone will reportedly come equipped with a screen capable of displaying three-dimensional (3-D) images without a special glass, which would provide the world's biggest online retailer with a competitive edge over well-established smartphone makers like Samsung. It is also being said that the potential Amazon phone will have a fingerprint scanner. Given the fact that Amazon is the top online retailer in North America, this feature is expected to become a vital addition to the handset's arsenal. Just like the company's Kindle Fire tablets, the Kindle smartphone is also expected to run on a heavily-skinned Android OS, which also restricts access to Google Play Store. 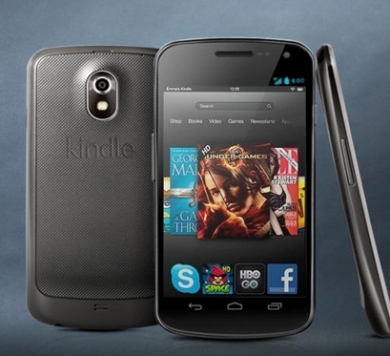 Rumors about an Amazon smartphone have been swirling for a really long time. In fall last year, when rumors swirled that the company might offer a free handset with or without a contract, a spokesperson for the company said that if and when it did introduce a phone it would not be free.